Pumpkin seed protein powder is new to many people, yet offers quite a few benefits and advantages over other types of protein. It is loaded with dense nutrients and a robust amino acid profile, and also boasts high levels of health fatty acids like Omega-3 and Omega-6 oils. Sprout Living is an exceptional company that makes a wide range of truly unique products. Sprout Living’s success was hatched from the insight of the brothers Malinsky—both Mark and Alex—regarding the amazing benefits that sprouted foods have to offer. The Organic Pumpkin Seed Protein Powder from Sprout Living offers a powerful amino acid profile, consisting of essential, non-essential, and branched-chain amino acids (BCAA). Many of the best protein powder supplements on the market are plant-based ‘blends’ such as this one, which offer the benefits of many different nutrient-rich sources. This product is USDA Organic, is GMO-Free, is gluten free, is certified Vegan friendly, and produced in a way that makes their pumpkin seed protein powder highly assimilable and bioavailable. Sprout Living is setting an example of responsible manufacturing, and if you’re interested in powerful macro nutrition, their Organic Pumpkin Seed Protein Powder is a powerful means to give your body they protein it craves! Pumpkin seeds are powerful, nutrient-rich superfoods that contain not only a powerful blend of amino acids, but also a wide range of useful vitamins and minerals. 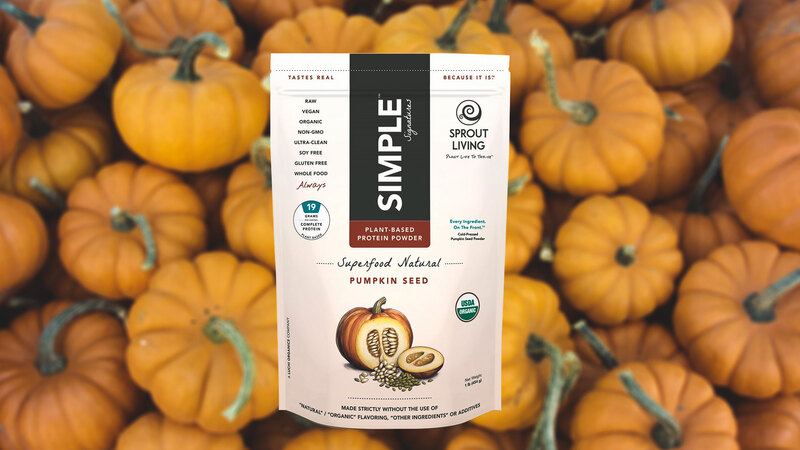 The Organic Pumpkin Seed Protein Powder from Sprout Living is harvested from organic farms that ensure their pumpkins grow to maturation free of harmful pesticides such as glyphostate. In addition to their potent supply of aminos, pumpkin seeds are rich in Omega-3 and Omega-6 fatty acids. Pumpkin seeds are high in zinc, which is known to be very beneficial to your immune system and in the reduction of inflammation. Overall, pumpkin seed protein is similar to Hemp Protein in that high levels of healthy Omega-3 and Omega-6 polyunsaturated fats, but also unique in it’s rich unique flavor. Many Vegan protein powder products look to unique plant-based protein sources such as this one to help provide a more complete blend of nutritive ingredients. There are several resources online that discuss pumpkin seeds as being able to boost testosterone naturally, but that isn’t exactly the case. Pumpkin seeds have been shown to help balance hormonal levels in general, but it seems the claims of testosterone-boosting power are more linked to their zinc content. One study found that by reducing the amount of dietary zinc among young men, the levels of testosterone dropped considerably. It’s correlative at best to say zinc boosts testosterone, and really a stretch to say that pumpkin seed protein powders do because they contain zinc. Regardless of it’s ability to boost testosterone, pumpkin seed protein contains a very dense profile of vital nutrients capable of affording your health many benefits. 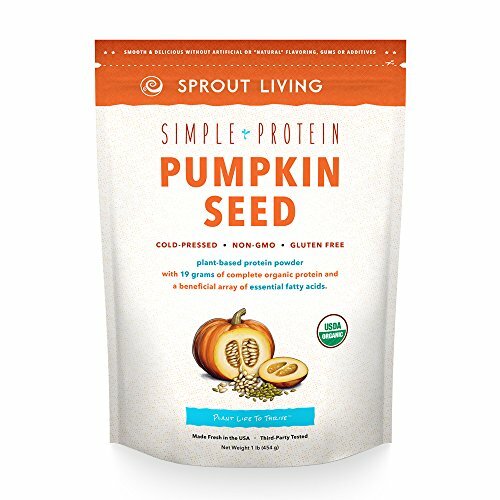 Sprout Living is well aware of this potential, and their manufacturing processes ensure that their Organic Pumpkin Seed Protein Powder is processed in a way to preserve all it’s natural glory. Sprout Living doesn’t play around when it comes to quality assurance of their products. They know it’s pointless to source vibrant, sprouted superfoods if they denature them during the processing stages. Many protein powder companies used harmful acid-washing methods to extract protein powders, some so much so they even have to add nutrients back into the protein powder later! Sprout Living uses a Cold-Press processing method that pulls out the protein powder without using harmful chemicals or extreme temperatures. Good manufacturing is about more than just the ingredients one puts into a product, and starts from the source. Sprout Living believes fully in the commitment to a Vegan lifestyle. By eliminating animal-based foods and products from your life, they believe you can help contribute to a factory-farming free society. Factory farming is the practice of industrialized farming on large scales, that often involves the inhumane treatment of animals. GMO foods are a hot topic in today’s world, and regardless your stance on them, there’s at least one undeniable fact; GMOs are a new addition to our Planet, and to us. The Organic Pumpkin Seed Protein Powder from Sprout Living is free of GMO products and certified USDA Organic—offering all it’s dense nutritive power in a healthy and chemical-free form. The Organic Pumpkin Seed Protein Powder can be purchased directly from Sprout Living’s official website. There you’ll find a wide selection of many other wonderful Organic Plant-based products such as broccoli and kale sprout mixes, Sacha Inchi Protein Powders, and even a Red Clover & Daikon Radish Sprout mix. Sprout Living has been working tremendously hard to put out some really incredible products. They’ve got their ear to the ground, and are hearing every spoken word from people demanding healthier and higher-quality supplements. 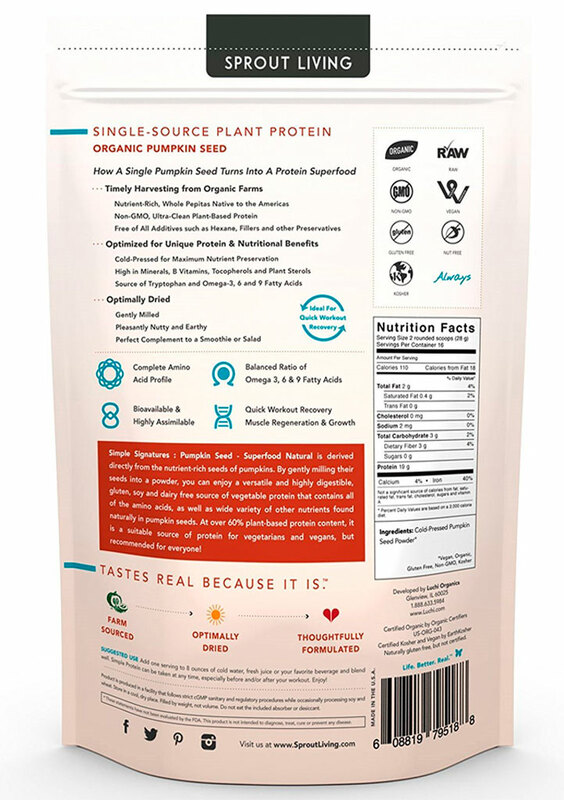 In addition to their official online store, Sprout Living’s Organic Pumpkin Seed Protein Powder can be purchased through Amazon, as well as many of their other great products as well. Vitamins and supplements can help provide a truly amazing benefit to your overall health when used properly. Understanding your needs as an individual can be insanely hard sometimes, and it pays to have the opinion of a doctor or licensed dietitian to help guide you. Another very real danger are supplement companies that don’t worry about the quality of their ingredients, and are happy to push toxin-laden mystery powders onto the market for a quick buck. Take forskolin for example, a herbal extract that shows promise as a weight loss aid. There are all kinds of forskolin supplements on the market that are little more than imported powders from overseas. Sprout Living is a company that takes quality seriously, and it’s very evident throughout their entire product line. If you’re serious about your nutrition, and want to add a truly unique product to your supplement shelf, you should check out Sprout Living’s Organic Pumpkin Seed Protein Powder. Sprout Living is a truly unique maker of what many would consider artisan nutritional products. They are firm believers in the benefits of a vegan lifestyle, as well as the increased nutritive power of sprouted foods. Their Organic Pumpkin Protein Powder is a great choice for if you're looking for a change of pace.